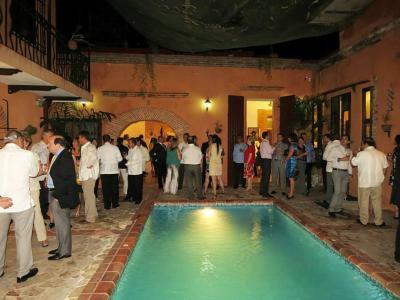 the location ( right in the middle of zona colonial ) , the architecture (converted 1550 mansion around a shady pool under a three story mango tree !)... the lovely staff ! 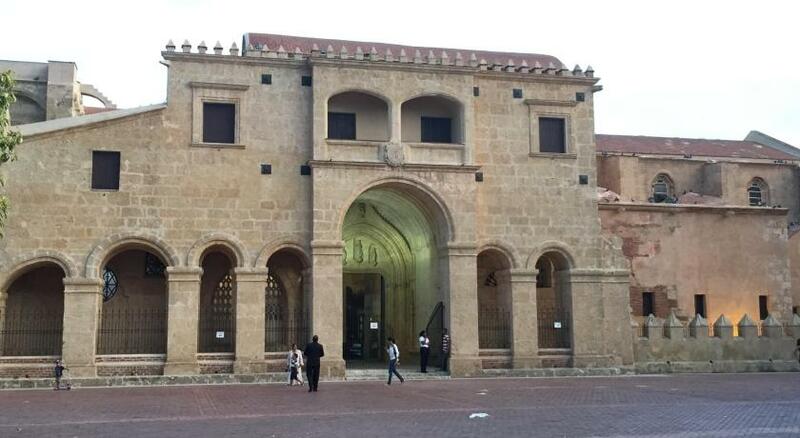 The location in the zona colonial is really nice. Colonial style built to complement with the zone. Gives a glimpse of what to expect when tackling the colonial zone. Very confort rooms to relax, quite with a breeze of kind and smiles from the staff. The food is amazing if Estafiny is cooking, lovely woman. Very close to the attractions of the zone, close enough to start walking and sightings the old buildings of the zone. Great place to stay while visiting the colonial zone. The pool area gives a nice vibe to just stay there forever and relax. The location is fantastic. In the heart of the Colonial Zone and within walking distance to main tourist sights. I had taken a bus from Punta Cana to Santo Domingo. I got off at the Parque Enriquillo bus stop and walked south for about 15 minutes down Av. Duarte and there I was at the hotel. There's a Jacuzzi on the roof with an area for sun tanning. Location and quietness and the breakfast . My pasta was not good for the price and tasteless plantains for tne dinner .. no bread . Another option for white wine besides cheap chardanay would be helpful . Dona Elvira Boutique Hotel This rating is a reflection of how the property compares to the industry standard when it comes to price, facilities and services available. It's based on a self-evaluation by the property. Use this rating to help choose your stay! Experience the first city of the Americas at this charming 16th century hotel, located in the center of the historic and trendy Zona Colonial, Santo Domingo. Combining old-world elegance and contemporary style and sophistication, guests at the Dona Elvira hotel can appreciate the number of modern amenities available for their convenience, such as free Wi-Fi internet access. The hotel Dona Elvira strives to make your visit memorable. With on-site Spanish lessons available as well as a library containing historical books, your stay is sure to be unforgettable. When would you like to stay at Dona Elvira Boutique Hotel? Room features one queen bed, one twin bed and a 2-level mezzanine with a very narrow staircase. This spacious room has one queen size bed and one single bed, plus air conditioning and a fan. The in-room amenities include a flat-screen TV, free Wi-Fi connection and a large window overlooking the patio. The large bathroom has a stylish Andalusian décor. Room features one king bed and one queen bed, a flat-screen TV and a large double bathroom. Room rate is based on 2 guests. Maximum occupancy is 5 guests. Please see Hotel Policies for extra guest charges. Room features one large king bed and one queen bed in the adjoining room. Room also includes a flat-screen TV and exterior Moorish bathtub. This air-conditioned apartment features 2 bedrooms, a kitchen, a dining room and a living room. There is a bathroom and a terrace. Please note that this apartment is located about 984 feet from the property. Check-in is at the hotel where guests have access to facilities such as breakfast, pool, hot tub and others. House Rules Dona Elvira Boutique Hotel takes special requests – add in the next step! Dona Elvira Boutique Hotel accepts these cards and reserves the right to temporarily hold an amount prior to arrival. They do not how to managed payments or reservations online. The girl at front desk was terrible. She does not know how to collect payments or how to handle bookings. TERRIBLE SERVICE. there was a party outside our room that ran fairly late, and was a bit noisy. They did not accept cards- cash only . Room was smelly . The noise directly outside the room until 2am; - gave away our reserved room and ended up in a former horse stall with a ladder to get to bed. Would have liked a coffee pot in the room. We get up early and coffee wasn't available til around 8. They had parties both nights in the hotel. The first night was ok, no music and only went on for a few hours. The second night however started at 3 in the afternoon and lasted til 10 with the music playing so loud that we couldn't hear eachother talk in our room. They took over the whole area around the pool which to me is supposed to be for all the guests that are actually spending their money to stay and sleep and enjoy the amenities. We couldn't enjoy anything that day as the party people were given top priority. Our dinner took an hour to cook and it was so bad we didn't eat it and went elsewhere to eat. After the music was turned down, they stayed on the pool deck area and partied til wee hours in the morning. Forget about sleep. There were several older coupled there as well as me and my friend, we weren't given any consideration whatsoever. Not acceptable and we should have been warned before we booked the room. We would have gone elsewhere for sure. Will not be going back to this location and will not recommend to anyone. The beds were adequate, the room was a good size. Wonderful location with caring staff. A charming courtyard and pool. It is affordable comfort accross the street from the Bellini Hotel which is upmarket and 5x the price but a bed is a bed. They did my laundry and were very attentive. Right next door is an eccentrically decorated pizza - italian restaurant. I will stay again. I was here for one night only. It is very close to a club with very loud music, the window had a sheer curtain only, so the room was very light. The bed had only a sheet. So with the air conditioning on, I was really uncomfortable at night. The guy at check in was not able to really explain things in English. The pool has no sun beds. The changing kitchen personnel had different cooking skills. I didn't get the chance to taste the drinks in the bar because there were no one to make them or I have to wait for someone to do it. Great location and nice clean rooms.